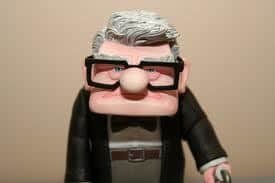 Don’t you think Buffett looks just a little like Carl from Up? Warren Buffett’s annual letter just came out on March 1st. Read it here. Disclosure: I own Berkshire Hathaway and have idolized Warren Buffett for years. Be prepared for a Warren Buffett lovefest. Also, if you want to go with Mrs. 1500 and I to see Buffett in the flesh in May, read on! What is the annual letter and why should you care? Warren Buffett is one of the greatest investors of all time. If you can consistently his performance, I’d like to hire you as my personal investment adviser. His annual letter is where he not only discusses the status of Berkshire Hathaway, but also talks about the state of the economy in general. It’s filled with all kinds of interesting tidbits and wisdom. I highly suggest you have a look. It’s not that long and parts of it will send chills down your spine (well, maybe if you’re a Warren Buffett geek like me). Before I discuss the letter, a little background information about Berkshire Hathaway (BH) is in order. BH is a holding company. A holding company doesn’t produce any goods or services itself, but owns other companies in part or whole. You may be surprised at some of the companies owned by BH: Dairy Queen, Brooks, Borsheim’s and Geico are all wholly owned under the BH umbrella. Additionally, BH owns shares of companies including Coke and IBM. The letter is a great read. Print it out and sit down with a highlighter. Read it a couple times. You may want to have a computer near to look up some of the technical stuff. I guarantee that you’ll learn something. The 19.7% number is Warren Buffett’s annual percentage gain from 1965 to 2012. The 9.4% number is the S&P 500’s annual gain. He doubled it! INCREDIBLE! When the partnership I ran took control of Berkshire in 1965, I could never have dreamed that a year in which we had a gain of $24.1 billion would be subpar, in terms of the comparison we present on the facing page. But subpar it was. For the ninth time in 48 years, Berkshire’s percentage increase in book value was less than the S&P’s percentage gain (a calculation that includes dividends as well as price appreciation). In eight of those nine years, it should be noted, the S&P had a gain of 15% or more. We do better when the wind is in our face. In 2012, Buffett didn’t beat the S&P 500. The S&P returned 16.0% while Buffett earned 14.4%. However, he has beaten it in 39 out of 48 years. This is spectacular performance. He also states that he does better ‘when the wind is in our face.’ So, Buffett does better when the markets are underperforming. Unless the U.S. economy tanks – which we don’t expect – our powerhouse five should again deliver higher earnings in 2013. The five outstanding CEOs who run them will see to that. One theme throughout the letter is Buffett’s incredible optimism for the US economy. If Buffett is optimistic, you should be too. As a BH shareholder, one concern I have is Buffett’s age. At 82, he is no spring chicken. What will become of BH when he passes on? If you have the same concerns, the letter is sprinkled with praise for the folks around Buffett. This makes me feel a lot better about the long term success of my investment. Also, this seems to be a common theme with Buffett in general; surround yourself with smart people of high integrity they’ll get the job done. I also like his humility. If he has not done something well or someone is doing a better job, he calls himself out. Berkshire’s “Big Four” investments – American Express, Coca-Cola, IBM and Wells Fargo – all had good years. Our ownership interest in each of these companies increased during the year. The four companies possess marvelous businesses and are run by managers who are both talented and shareholder-oriented. At Berkshire we much prefer owning a non-controlling but substantial portion of a wonderful business to owning 100% of a so-so business. I always love to learn about what successful people invest in. So, here is your answer for Buffett. Again, these are companies that Buffett owns stock in, but does not own outright like Geico. I like what he says about owning a non-controlling part of these businesses. Buffett recognizes that all 4 of these companies are very well run, so he is happy to let them do their thing; no need to interfere. I love his bravado. No fear for Buffett. I also like that he is investing heavily in the United States. Many are terrified about a rising China, not Buffett. We will keep our foot to the floor and will almost certainly set still another record for capital expenditures in 2013. Opportunities abound in America. Again, I love the optimism. If you’re an investor and this doesn’t inspire you, nothing will. I also love how he trashes the market timers. Buffet doesn’t jump in and out of holdings. He buys solid companies and sticks with them for a long, long time. A century hence, BNSF and MidAmerican Energy will continue to play major roles in the American economy. Insurance, moreover, will always be essential for both businesses and individuals – and no company brings greater resources to that arena than Berkshire. As we view these and other strengths, Charlie and I like your company’s prospects. One of Buffett’s core investment philosophies is to invest in companies with ‘strong moats’ that therefore, have tremendous staying power. In the quote above, Buffett is saying that he expects two of his holdings, BNSF and MidAmerican to still be around in 100 years. I don’t know much about energy, but railroads (BNSF) aver very expensive to start. Laying a mile of track costs millions. Locomotives also cost millions. Right of way has to be secured, etc. In short, no-one is going to take down BNSF any time soon. Buffett realized this and that is why he now owns it. Do you think Apple or Google will be around in 100 years? Our managers must think today of what the country will need far down the road. Energy and transportation projects can take many years to come to fruition; a growing country simply can’t afford to get behind the curve. We have been doing our part to make sure that doesn’t happen. Unlike almost every analyst out there, Buffett thinks very long term. Many of the things he is working on probably won’t even pay off until he is long gone. In my opinion, people would be a lot better off if they thought like Buffett instead of trying to turn a quick buck. The doors will open at 7 a.m., and at 7:30 we will have our second International Newspaper Tossing Challenge. The target will be the porch of a Clayton Home, precisely 35 feet from the throwing line. Last year I successfully fought off all challengers. Challenge Buffett to tossing newspapers, awesome! At 8:30, a new Berkshire movie will be shown. An hour later, we will start the question-and-answer period, which (with a break for lunch at the CenturyLink’s stands) will last until 3:30. After a short recess, Charlie and I will convene the annual meeting at 3:45. If you decide to leave during the day’s question periods, please do so while Charlie is talking. This part sounds really cool. I’d love to hear what Warren and Charlie have to say. On Sunday, in the mall outside of Borsheims, a blindfolded Patrick Wolff, twice U.S. chess champion, will take on all comers – who will have their eyes wide open – in groups of six. No way I’m taking on this guy, but it sure would be fun to watch. Mrs. 1500 and I have decided that we’re going to attend this year. It happens the weekend of May 4th. I get 4 tickets and my 3 and 6 year are going to sit this one out. That leaves me with two extras. If you want to go, drop me a line here or email at: mr1500 at 1500days dot com. Thanks for the link to the most recent Berkshire letter! Warren is the greatest investor ever and I love how he explains investing so it seems like common sense. I recently finished a book by Carol Loomis called Tap Dancing to Work. It is a compilation of all the Fortune magazine articles about Warren along with commentary. Very interesting. I’m going to go check out that letter to shareholders right now! Thanks for the link to the most recent Berkshire letter! Warren is the greatest investor ever and I love how he explains investing so it seems like common sense. Yes, completely agreed. His long term philosophy stands in sharp contrast to all of these other analyst clowns who seem to only look a day or week ahead. That book in mentioned in the letter! I’m going to request it at my local library now. A newspaper throwing challenge. That’s awesome. I need to make my way to some annual meetings but can’t do so just yet. Berkshire’s sounds like it’d be great. I don’t think you can go wrong with learning from 2 of the best investors of their generation if not all time. Have fun in Omaha! Mr. PoP actually met Warren Buffett years ago when an academic team he was on went to the national competition in high school. Buffett was there and my MIL still has a picture of Buffet whispering in 17-year-old Mr. PoP’s ear. That is an awesome story and I love your shareholder letter, great idea! I’ve not had a chance to read it yet, but always do. I am a shareholder as well and actually live about ten minutes from Warren. You’d never know by driving by his house that he is one of the richest men in the world. We’ve made to the last few meetings, but am not certain about it this year as my youngest brother is graduating from college in Montana, so we may be there instead. By the looks of it though, we’ll be in attendance to see Warren & Charlie. Yeah, I’ve heard he’s lived in the same home that he bought in 1958. This article doesn’t say what the current value of it is, but I thought it was somewhere around $700,000. Pretty amazing for one of the richest guys in the world. See you in Omaha maybe! Thanks for the breakdown… Warren is certainly as inspiring a financial figure as there is! I see you write about books, very cool! I’m going to read Buffett’s biography, The Snowball, when my time frees up a bit. Very cool words of wisdom from Buffet. I mean, you can’t argue with success! Thanks for the amazing post! Yes, super success! I hope Berkshire can sustain it’s principals and success after Warren and Charlie have left the building. One really neat thing is that at this year’s meeting, Buffett is bringing in an analyst who has been shorting Berkshire as an opposing voice. Should be fun to watch! I supported your investment by eating a lot of Dairy Queen Blizzards in 2012. I am sure I am partly responsible for growth of BH. You could see a dip in 2013 growth because I have cut my junk food budget back to $6.00 per week so Dairy Queen earnings will be way down. Hilarious! Thanks Jane! I love the Blizzards as well. Mint Oreo, mmmmmmmmmmmmmmm. Berkshire also own Brooks (running shoes). With the money you’re saving from DQ, perhaps a new pair of shoes is in order? Cool! I’m actually much less worried than I used to be. As long as they stick to their principals, it will all be OK.